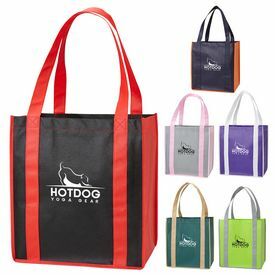 We have a wide variety of promotional Tote bags for your company without any set up fees. 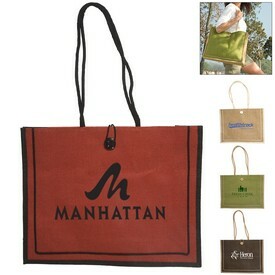 The Non Avenue Shopper custom tote bags are made of 80 gram non-woven polypropylene. 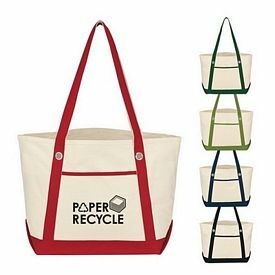 The tote bags are water resistant and recyclable. You can hand wash and reuse the bags as many times as you want. 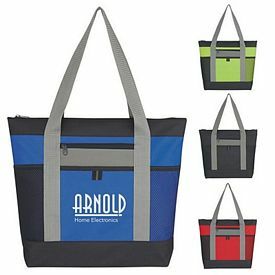 The 21” reinforced handles with 8” gusset and matching covering bottom insert is available in multiple colors like tan, black, royal blue, navy, Kelly green, forest green, purple, red or natural. Free artwork eproof will be done and no setup fees for imprinting will be charged. 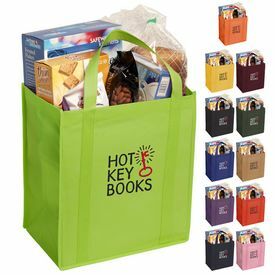 The giveaway promotional tote bags with company imprint come with a free 24 hour rush service. 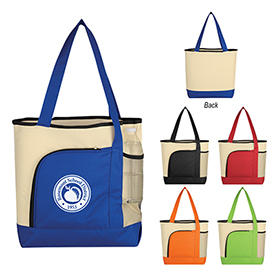 The promotional Atchinson It Transport Tote bags are zippered tote bags. There is a front slip pocket to keep all your essentials. 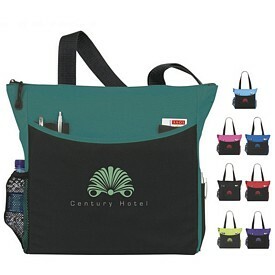 The pen and business card pockets bundle up on the utility factor of the zippered tote bags. Mesh water bottle pocket, side cell phone pockets and shoulder length handles are its other features. 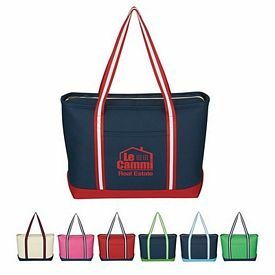 You can buy the zippered tote bags in apple green, royal, light blue, red, fuchsia or black. 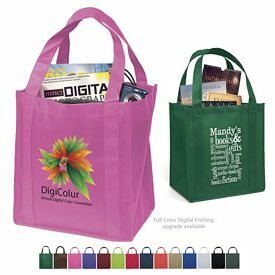 You can upgrade the giveaway promotional tote bags with company imprint to full color digital printing. 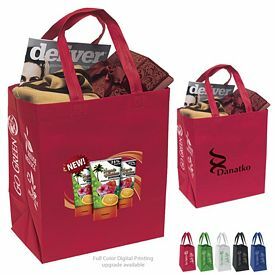 The customized Sovrano Teramon Metallic Tote bags can be excellent as tradeshow bags. 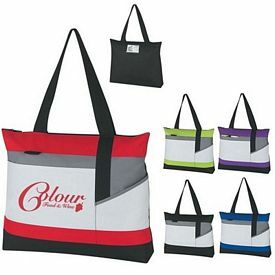 We do not charge any set up fees on the gold or silver colored metallic tote bags. 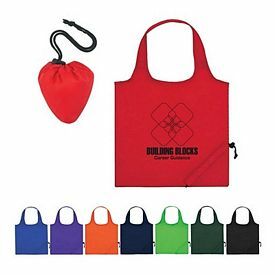 Free one color logo imprint and artwork eproof is included in the price. 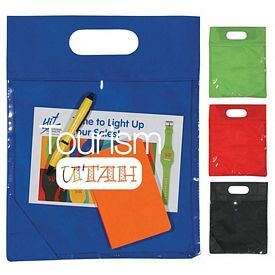 The custom tote bags are made of 85 gsm laminated PP. 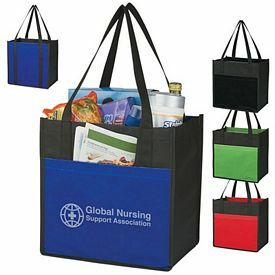 Another kind of exceptional tradeshow bags are the promotional Value Non-woven Trade Show Tote Bags. 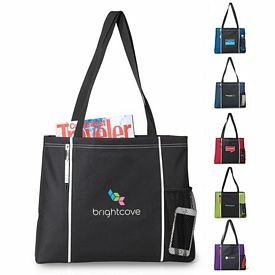 The branded tote bags look sleek with interior seams. The reinforced handles are 22 inches in length. 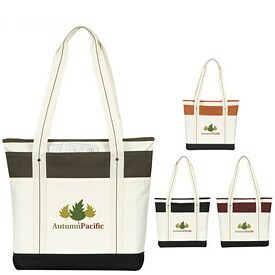 The material which is used for the manufacturing of the promo tote bags is 80GSM non-woven polypropylene. 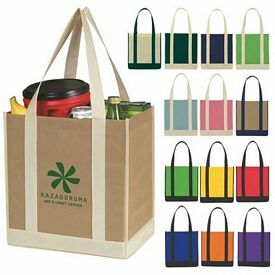 Polypropylene is durable and eco-friendly and is one of the most favoured materials when it comes to Tote bags. 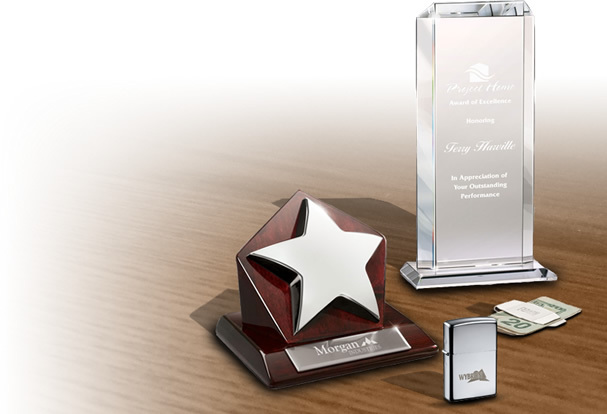 We charge no setup fees for imprinting your company logo and artwork eproof. 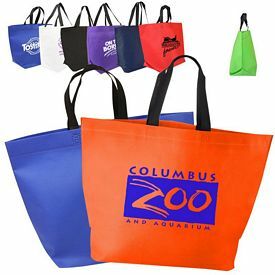 Select the promotional tote bags from a variety of colors like burgundy, red, orange, yellow, lime green, hunter green, blue, navy blue, purple, white, or black. 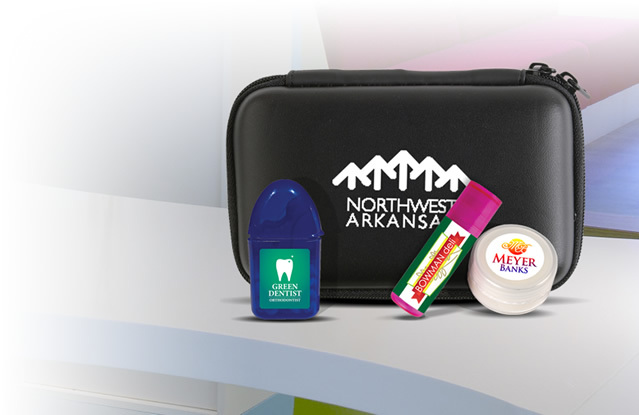 You can opt for a multi-colored imprint in 4 colors at additional charges. Full color digital printing upgrade is available. 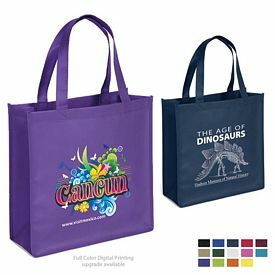 We give a free 24 hour rush service on the custom tote bags. 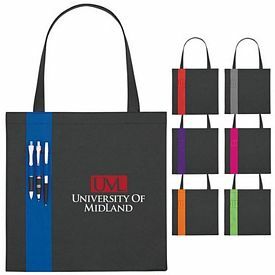 The logoed Lunar Convention canvas tote bags have a beautiful arch design which is highlighted by keen piping. There are two elastic pen loops and a D ring for the storage of keys. The key loops are in the front handle. 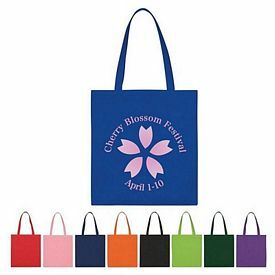 You will get the tote bags in colors like black, orange, pink, purple, red, royal, and spring green. 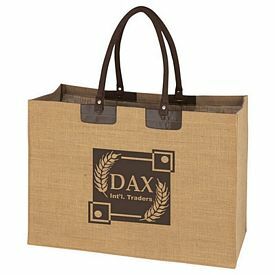 The material of the tote bags is 600D Poly canvas and is available with a free 24 hour rush service. No setup fees for imprinting are charged. Free artwork eproof is provided. 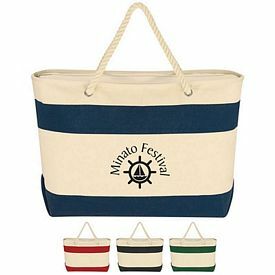 The customized Medium cotton Canvas sailing Tote bags can work as great promotional Canvas tote bags. 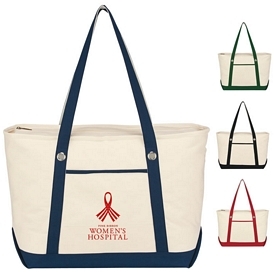 The branded tote bags are made of 13 oz. 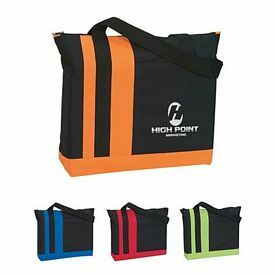 cotton canvas and have 27” handles with an outside pocket. 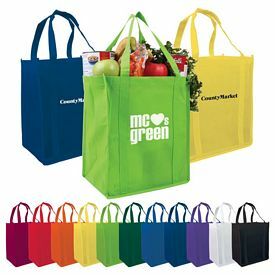 All the customized tote bags come in natural color but with different colored rims like lime green, navy, red, black, or forest green. 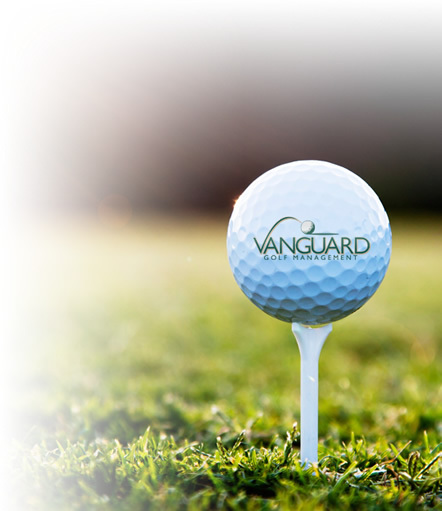 We charge no setup fees for imprinting or embroidering your company logo. 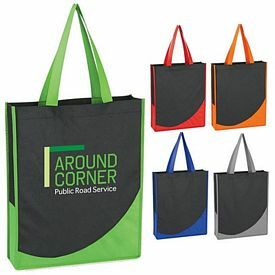 Free 24 hour rush service can be availed on the canvas tote bags. 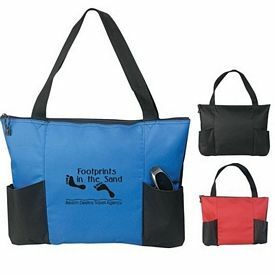 Rope a Tote Nylon Beach Tote Bag with pockets is perfect to be carried along when your customers are looking out for some beach fun. 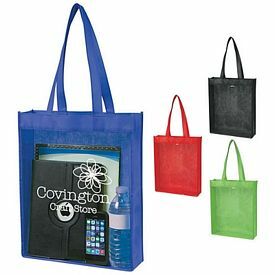 The promotional nylon totes with company imprint are made of 600D nylon and have a zippered inside pocket. The 22 inches rope handles come with a fabric covered grip. 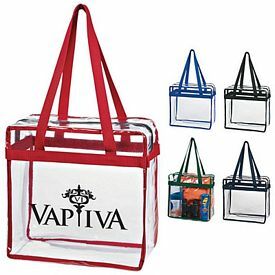 There are two large mesh pockets on the outside of the nylon tote bags. Colors can be royal blue, forest green, red, or black. Free artwork eproof is done. 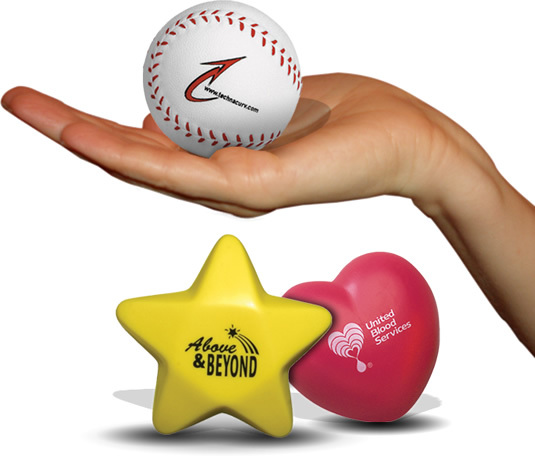 There is no set up fees for imprinting your business logo and tagline. We have a free 24 hour rush service to meet your requirements. 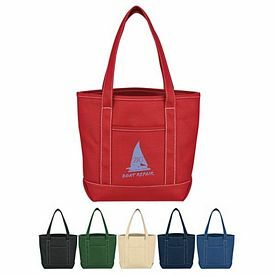 If you are looking for jumbo totes then the large cotton canvas yacht tote bags can be your ideal choice. 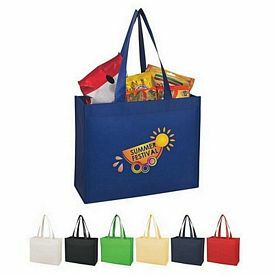 The 25 oz Canvas tote bags come in various colors like natural, royal blue, navy, red or forest green. 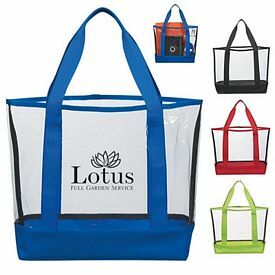 The features of the jumbo totes are outside pocket, zippered top closure and 30 inches handles. 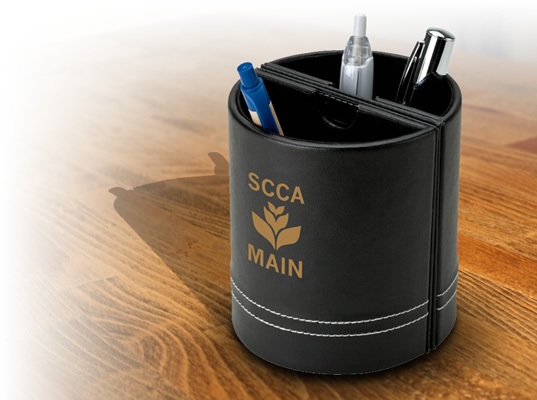 You can upgrade to a 7000 stitch including five colors for the imprint. 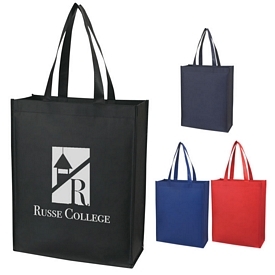 We do have a free 24 hour rush service so that you can get your promotional Tote bags quickly. 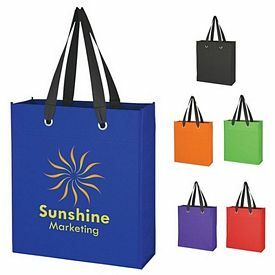 The promotional Zippin’ Tote bags are customized zipper tote bags that come in creative colors like burgundy, red, lime green, hunter green, reflex blue, purple, and black. 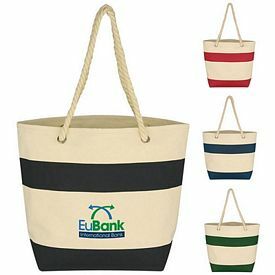 The folding zipperered tote bags with front pockets are made of 80 gsm non-woven polypropylene which is both eco-friendly and resists tear. The zipper has a metal ring so that you can attach your plastic keytag store discount vouchers, membership cards and loyalty cards. The 22” reinforced handles increases handling efficiency. 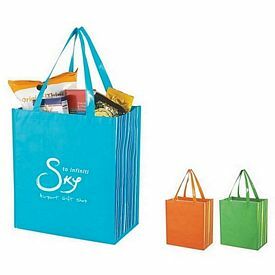 You can easily fold the customized tote bags into a small and slim pouch and save storage space. 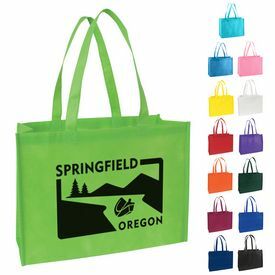 We will provide you the zippered tote bags with a free one color logo imprint and free artwork eproof. 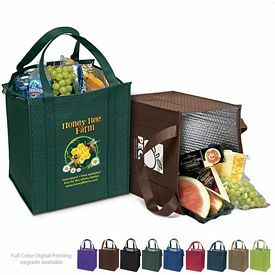 You can upgrade to full color digital printing at an extra charge. 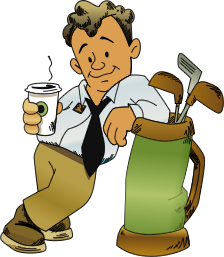 Order the products with a free 24 hour rush service. 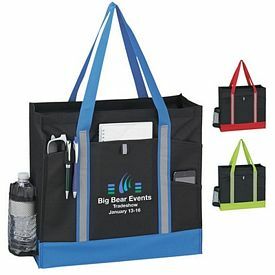 We have a number of executive polyester Tote bags that can be given away during corporate events. 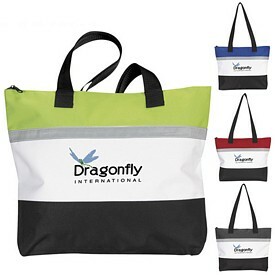 The giveaway promotional tote bags with company imprint have two side pockets and have a large front pocket to store cell phone, pens, calculators etc. The handles are 25 inches long. 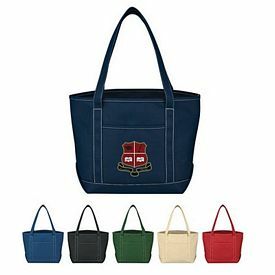 You will get the tote bags in red or royal blue but both with a black trim. 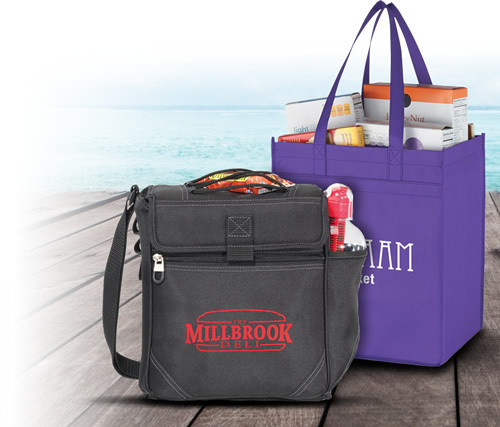 A free 24 hour rush service can be availed on the tote bags. 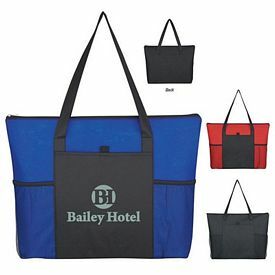 Show off your team spirit by promoting the RallyTotes Football Tote bags. 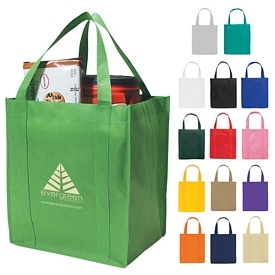 The eco-friendly polypropylene tote bags are available in nine colors. 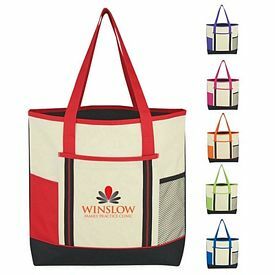 The design of the promotional bag includes a football stitching print.